Kabul - Karzai won plaudits for his inauguration speech on Thursday from Western officials including the US Secretary of State, Hillary Clinton, who said it was an "important new starting point" as the US-led war stretches into its ninth year. But he will face his first hurdle within weeks, with the international community and disillusioned Afghans keenly awaiting his cabinet line-up as a sign of his commitment to change. His Western backers, frustrated after pouring more than 100,000 troops and billions of dollars of aid into Afghanistan with little in return, have demanded strong action from Karzai, whose reputation has been tarnished by his fraud-ridden re-election and rampant corruption and mismanagement. "My feeling is that President Karzai is sincerely committed to implementing his pledges," said Ettore Sequi, the European Union's special representative for Afghanistan and Pakistan. "The future will tell us but I believe we are going in the right direction. "The president has expressed what is his programme, what is his vision and analysis of the realities and what he believes are the priorities." "We should encourage him in implementing his programme." 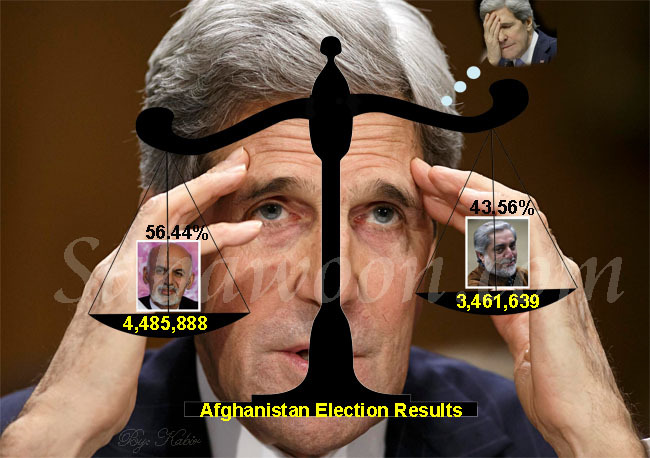 The nature of his election win - with almost a million fake votes "cast" in his favour - highlighted astounding levels of graft in Afghanistan, now billed by Transparency International as the world's second most corrupt country - second after Somalia. That in turn led to questions in the United States, Britain and other Nato countries involved in the war against the Taliban, about the value and wisdom of continuing support. As polls indicated popular support for the war falling, leaders including the US president, Barack Obama, British Prime Minister Gordon Brown and Nato's secretary general, Anders Fogh Rasmussen, began browbeating Karzai to prove his worth. Washington has increasingly expressed concern about Karzai's reliability as a US ally and effective head of state, but with Thursday's speech, he seems to have passed the first test. Pledges to do better included eradicating corruption, putting the country's security in Afghan hands in five years, and creating jobs for unemployed youth - fertile ground for Taliban recruitment. He promised to deal with opium production - 90 per cent of the world total - which also feeds corruption and the insurgency, and to hold a "loya jirga", or inclusive national conference, on forging peace. Going some way towards healing the wounds that have festered in recent months, he said Kabul would host a conference "to open a new chapter in cooperation and assistance between Afghanistan and the international community". With foreign troop deaths approaching 500 for this year alone, the United States is bearing the major burden of the war, and is keen to switch emphasis from battle to training the Afghans. But the US defense secretary, Robert Gates, said on Thursday it was too soon to set a timeline to transfer security duties from Nato-led troops to Afghan forces, as proposed by Britain. Western officials have given Karzai six to eight months to show solid progress before donors seriously consider pulling the plug. Clinton made it clear that Karzai's past cabinets - including warlords, drug dealers, accused rights abusers - have "raised questions" about his "commitment to not only fight corruption but to actually deliver results". "I have made it clear, as have others, that we would far prefer that the president have people in the cabinet with professional skills, with experience and expertise who can actually do the work that is required," Clinton said. Producing an acceptable cabinet will not be easy, a European diplomat said on condition of anonymity. "He has to reward the people who delivered votes to him, but he is under enormous pressure from the international community to put the people they want into positions of power," he said. "It's a delicate balance. But he has made promises to too many people, so that is his protection - there have to be losers." For Washington, Karzai has transformed himself into a man the administration believes it can work with - but one it intends to keep an eye on. "The commitment that we heard today from President Karzai gives us all a very strong base on which to measure the actions taken by his government," Clinton told reporters. "We're going to, along with the people of Afghanistan, watch very carefully as to how that's implemented."